Today I made some progress on the bungalow. Before I glue the bottom floor walls up I need to finish the exterior and interior walls. This meant I had to finish all the outside walls and windows first. I decided I wanted more windows than the kit provided for, so I cut some holes in one of the side walls. 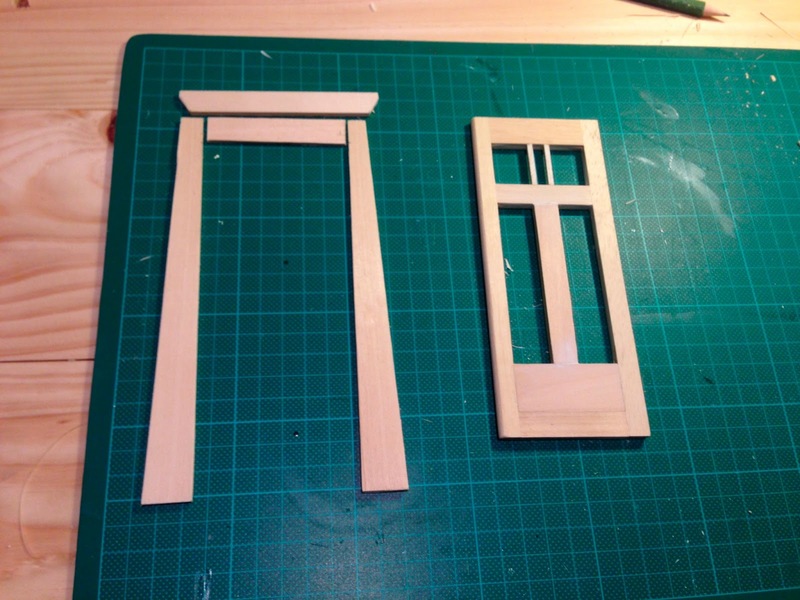 These will be small ornamental windows on either side of the mantle piece in the lounge room. This meant I had to make these windows from scratch. I first made the inserts. 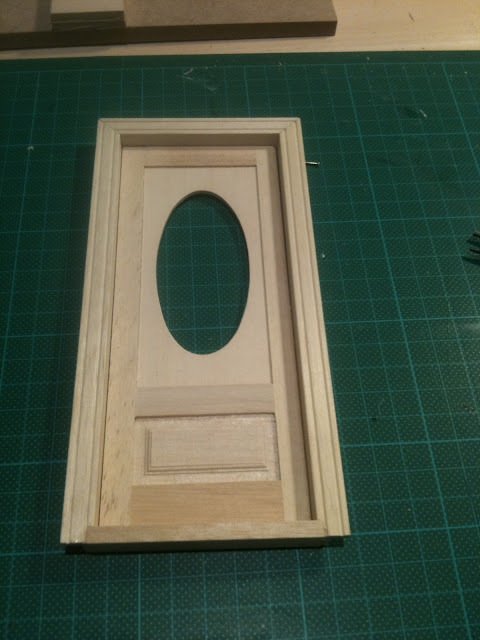 Then I set about making the outside architraves in the same style as the large windows. Next I did the interior of the windows - being the small glass pane dividers. I "dove tailed" them for a neater and stronger fit. I used some spare bits of wood underneath when I glued these pieces in, that way they ended up in the middle of the frame uniformly - avoiding a lot of cursing and stuffing around! I didn't like the front door provided by the kit, so I decided to improve it. I picked it apart, and turned it upside down. Then I used some spare base wood to patch the base up, which weighted it correctly and stopped it from looking like it was upside down. Then I added a solid divider in the centre and parallel dividers on the top window. I also turned the door frame around so that the external architraves are now internal, and made a new frame which matched the windows for the exterior. I finally got the right colour combination too, a deep forrest green/blue with a yellow tinted cream for trim. Soon I will glue the walls up, but for now they are just balancing so I can get a feel for the finished product. It is looking good Emily, I like your new front door and the windows looks great. Wow, you made a lot of progress. The bungalow is becoming very beautiful. Thanks, I am looking forward to the finished product. Now I have a work space at my home I will finish it a lot more quickly. Hi Emily! I love the exterior color combination and the wood trim around the windows and the door are spot on! How clever to think to reverse the original details of the door. It has given you something entirely original and fits the profile so much better. I just 'A-DOOR' your creativity and ingenuity! Wow. What wonderful work! Your creativity and technique are impeccable. Congratulations on a job well done. Looking forward to more posts! thanks Brad, glad you like it! Love, love, LOVE it. It's like a Greene & Greene bungalow moved from Pasadena to Australia and got new windows. Yes, I did a lot of research on Greene & Greene! glad you like it ! Very interesting to see the changes you are making - I'm visiting via the link on Anna's post. Thanks Norma, hope you can follow along! Thanks! I am looking forward to making some changes to the rafters and porch posts.